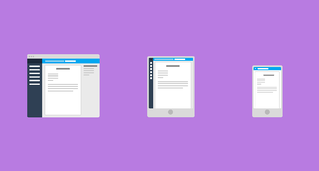 This post is the second in a series about PeopleDoc’s UX. To read the first post, click here. I recently sat down with PeopleDoc’s Head of UX, Nicole Harris, to learn more about PeopleDoc’s approach to user experience. In this post, we explore PeopleDoc’s user experience principles and what makes a good UX. What are some of the user experience principles you adhere to? Help users learn and grow by applying existing design solutions to new problems. For users to truly enjoy using our software, they need to feel that they have mastered our solutions. The best way we can support this is by ensuring every interface we design is consistent. Reusing and re-enforcing design patterns reduces user fatigue and helps users intuitively understand how to use new functionality. Does this design meet the user's expectations? Does it strengthen their intuition? Have we done a similar thing elsewhere? Should I use this pattern instead? Respond to user requirements by assessing available data. Don't assume you know what the user needs. Always take the time to find out by looking at their behavioural patterns and assessing their requirements. Remember that what a user says they want may not be what they need. Be thoughtful and considered by responding to the usability and accessibility requirements of our users. How do I know this design will meet our users' requirements? Can I engage with the product team (or users directly) to find a better solution? Will this design be easy to use for all of our users? Do I need to change anything to make it more accessible? Provide a helping hand when and where it is needed. Many of our features are large and complex. This means that we should never assume that the user understands everything they can (or should) do on a page. Always label things clearly and provide contextual help. If I had never seen this page before, what would I not understand? How can I instruct the user with helpful content? Remove unnecessary distractions to help the user focus on the task at hand. Only show the user what they need in the context they are in. When things are too large and difficult, break them down into smaller steps. Can I break this complex page down into more steps? Should every element I have on the page be there? The principle measurement is how easy and intuitive our users find doing their everyday tasks. Many people assume that user experience design is about making a great product – but the product is actually just the facilitator. Great UX is about making your user great; making them fast and efficient; making them feel empowered and in control; helping them to do things they couldn’t do before. How do you know you are delivering good UX? There are a number of ways we can measure this, but the best way is by actually testing our designs with users. Can the user complete the task quickly? Is it obvious to them? What do they understand on the page? What do they not understand? If it is a new page, do they find it intuitive? Do they have a feeling of being in control? Does the interface behave how they expect it to? We then take the information we have gathered in our user tests and update our designs accordingly. By adhering to our accessibility standards we also ensure that the largest number of users can be effective within our interfaces. There is no point building great UX if not all your users can benefit from it!